Kesar pista Phirni is a delightful variation of the phirni. 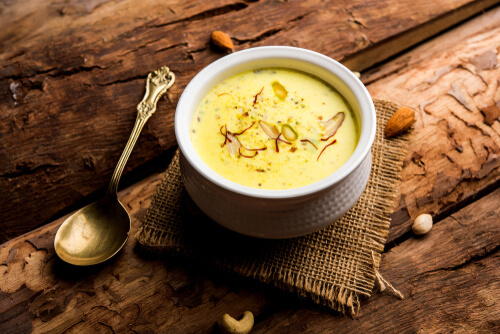 Kesar pista phirni is loaded with the aroma of saffron and the indulgent flavor of pista. 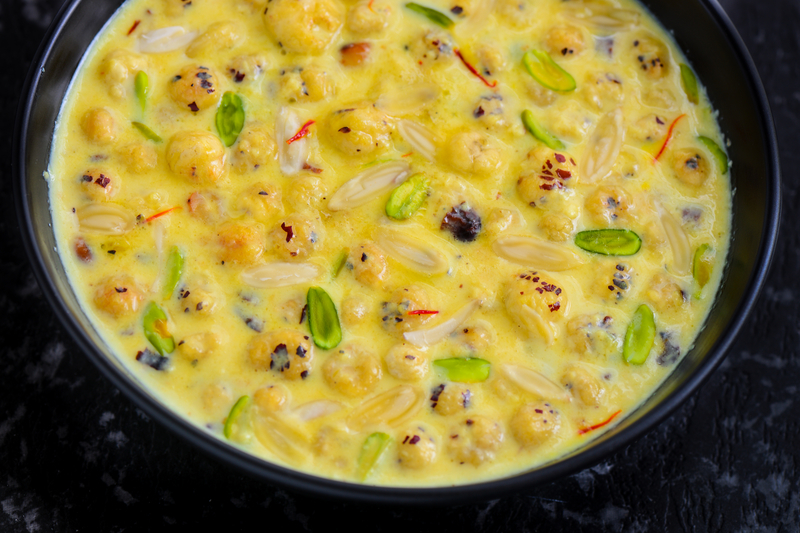 This delectable sweet dish comes from the Awadhi cuisine of Uttar Pradesh. Kesar pista phirni is usually eaten hot with hot pooris or enjoyed as a chilled dessert after food. 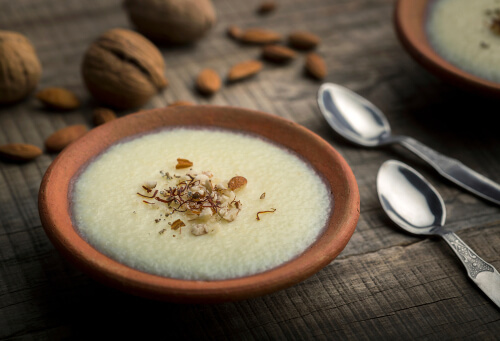 Kesar pista phirni is usually made on festivals like Holi, Dussehra, and Eid. 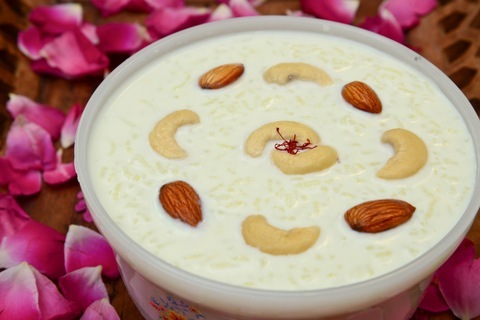 Kesar pista phirni is a good source of calcium and protein as it is prepared from milk. 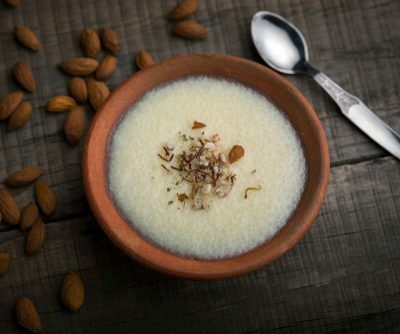 Kesar pista phirni contains the double benefits of kesar and pistas. 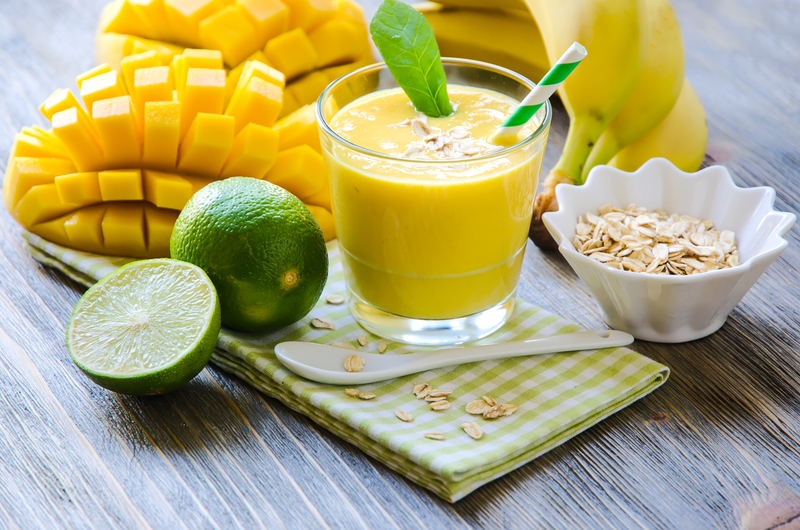 Kesar contains a carotene which protects against cancer. It is used to treat memory loss and in the treatment of Parkinson’s disease. Warm saffron milk helps in protecting against cold. Pistachios prevent cell damage, protect eyes against damage, and protect against high blood pressure. Soak the saffron strands in 1 tbsp of warm milk and keep aside. Wash the rice with water. Soak the washed rice in 1 ½ cup of water for 30 minutes. Drain the water completely and grind soaked rice to a fine paste. Keep aside. Heat milk in a heavy bottomed pan. When the milk boils, lower the flame and add the ground rice paste. Stir the milk and ground rice mixture constantly to ensure the rice gets properly mixed in the milk and no lumps are formed. 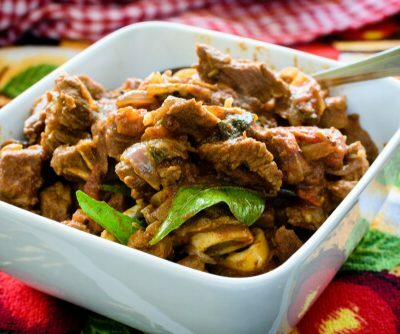 Keep cooking the milk and rice mixture on low flame until the rice gets completely cooked and the milk thickens. Now add the saffron milk, sugar, sliced pistachios, and cardamom powder to the boiling milk and rice mixture. 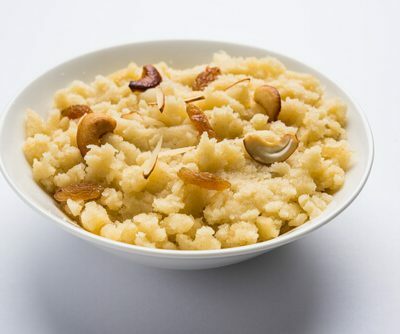 Cook the kesar pista phirni for 5 minutes while stirring continuously. Transfer the Kesar pista phirni to small serving bowls. Garnish the kesar pista phirni in bowls with the chopped pistachios and chill in the refrigerator for 2 hours so that it sets. 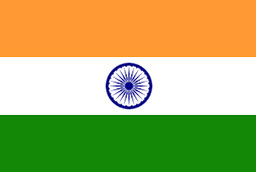 Saffron, the aromatic spice used in Kesar pista phirni, is the most expensive spice in the world as a pound of saffron comes from about 80,000 flowers. It takes about 12 days to pick this many flowers. In Bavaria during the early 15th century, any merchant caught selling adulterated saffron was burned alive!